Manuscript submitted June 6, 2017; accepted June 10, 2017. 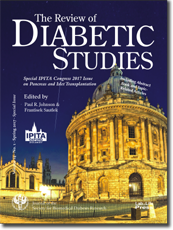 BACKGROUND: Pancreas transplantation (PTx) represents the method of choice in type 1 diabetic patients with conservatively intractable hypoglycemia unawareness syndrome. In 2005, the Institute for Clinical and Experimental Medicine (IKEM) launched a program to investigate the safety potential of islet transplantation (ITx) in comparison to PTx. AIM: This study aims to compare the results of PTx and ITx regarding severe hypoglycemia elimination, metabolic control, and complication rate. METHODS: We analyzed the results of 30 patients undergoing ITx and 49 patients treated with PTx. All patients were C-peptide-negative and suffered from hypoglycemia unawareness syndrome. Patients in the ITx group received a mean number of 12,349 (6,387-15,331) IEQ/kg/person administered percutaneously into the portal vein under local anesthesia and radiological control. The islet number was reached by 1-3 applications, as needed. In both groups, we evaluated glycated hemoglobin, insulin dose, fasting and stimulated C-peptide, frequency of severe hypoglycemia, and complications. We used the Mann Whitney test, Wilcoxon signed-rank test, and paired t-test for analysis. We also individually assessed the ITx outcomes for each patient according to recently suggested criteria established at the EPITA meeting in Igls. RESULTS: Most of the recipients showed a significant improvement in metabolic control one and two years after ITx, with a significant decrease in HbA1c, significant elevation of fasting and stimulated C-peptide, and a markedly significant reduction in insulin dose and the frequency of severe hypoglycemia. Seventeen percent of ITx recipients were temporarily insulin-independent. The results in the PTx group were comparable to those in the ITx group, with 73% graft survival and insulin independence in year 1, 68% 2 years and 55% 5 years after transplantation. There was a higher rate of complications related to the procedure in the PTx group. Severe hypoglycemia was eliminated in the majority of both ITx and PTx recipients. CONCLUSION: This report proves the successful initiation of pancreatic islet transplantation in a center with a well-established PTx program. ITx has been shown to be the method of choice for hypoglycemia unawareness syndrome, and may be considered for application in clinical practice if conservative options are exhausted.